She shot to prominence recently at IAAF World U20 Championships - India's Hima Das made history by becoming the country's first track athlete to become a world champion at any level after winning the women's 400m at the U-20 World Championships in Tampere, Finland. Hima is also only the second ever Indian athlete to claim a gold medal at the World Juniors, following javelin thrower Neeraj Chopra's victory at the 2016 edition of the championships. With a power-packed finish, India’s Hima Das sealed her nation’s first ever medal in the 400m at the IAAF World U20 Championships, sling-shotting to the lead down the home straight and coming home a clear winner in 51.46. Today at Ageas Bowl, Southampton, a minute ago, Indians were all out for 273 – India struggled against Mooen Ali who had a 5 wicket haul – Pujara remained unbeaten at 132; Ishant and Bumrah had good partnerships with Pujara. Rishab Pant, a known aggressor, played a rather uncharacteristic innings, remained without scoring and got out after 29 balls. Yesterday Kumara Dharmasena, ruled batsman notout to Ashwin delivery – India went on appeal – legitimate delivery, ball was in line and went on to clip the wickets – but as the decision was not out and since there was doubt on whether the ball straightened enough, Dharmasena was given the luxury of retaining his decision and he promptly declared batsman not out .. .. if the system cannot throw a result on whether ball straightened, how did it show that ball would for sure clipped the wickets. Today it was more eerie. Ajinkya Rahane was given out lbw and went on appeal. Ben Stokes appeared to have overstepped as no part of his foot was beyond the crease – yet Bruce Oxenford struck to his decision after review ruling Rahane out and triggering a collapse ! The Port of Southampton is a major passenger and cargo port located in the central part of the south coast of England. It benefits from a sheltered location, unique "double tides", close proximity to the motorway network and good rail links. It is the busiest cruise terminal and second largest container port in the UK. The port is located ten miles (16 km) between the confluence of the rivers Test and Itchen and the head of the mile wide inlet known as Southampton Water. It has a long history - It is stated citing archaeological findings that the area has been inhabited since the stone age. During the Middle Ages, shipbuilding became an important industry for the town. Henry V's famous warship HMS Grace Dieu was built in Southampton. The port had been used for military embarkation, including during 18th-century wars with the French. In 1912, the ill-fated RMS Titanic sailed from Southampton. The Supermarine Spitfire was designed and developed in Southampton. Heavy bombing of the factory in September 1940 destroyed it as well as homes in the vicinity, killing civilians and workers. World War II hit Southampton particularly hard because of its strategic importance as a major commercial port and industrial area. 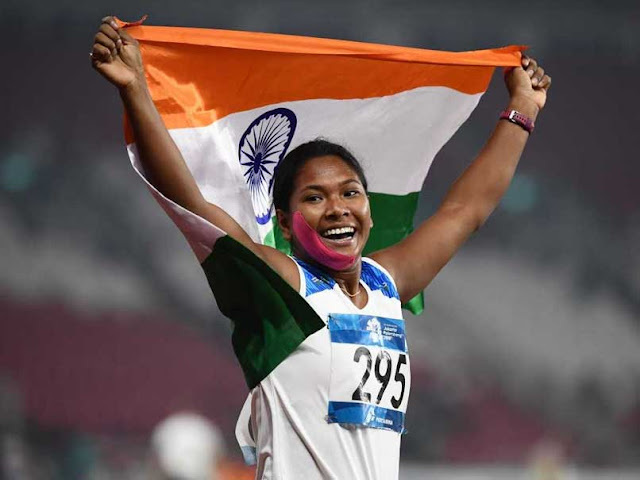 Now at Asian Games, Hima's outstanding sprint in the final stretch of her part along with the efforts of teammates Machettira Poovamma, Saritaben Laxmanbhai Gayakwad and Velluva Koroth Vismaya helped India retain their title. India now have 58 medals at Asian Games 2018 and 12 gold medals. 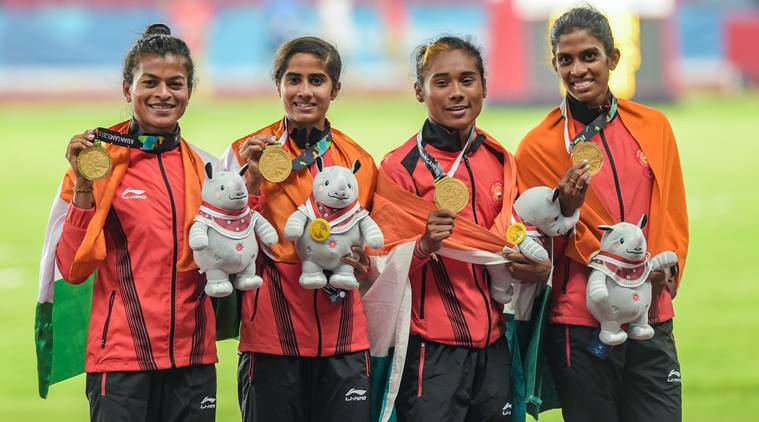 Perhaps, everything played out as per script for the Indian women in the 4x400m relay on the final day of the athletics programme at the 2018 Asian Games. Hima Das, the fastest quarter-miler in the country, gave the lead on the first lap with a searing run, setting a heady tone for the whole race, which the rest did well to consolidate, leaving their opponets in a helpless wake. Clocking an impressive 3:28.72s, they ensured India won its fifth 4×400 relay gold medal at the Asian Games on the trot. For Hima, who celebrated wildly, it was her first gold medal at the Games after enduring heartbreaks in 400m and 4x400m mixed relay. On both instances she had to settle for silver. Seasoned runner MR Poovamma, the only member from the previous winning squad that set a games record with an effort of 3.28.68, took the baton from the Assam girl and ensured India didn’t lose the advantage. From there on, victory seemed certain and the only question was about the margin. Bahrain (3:30.61s) finished almost two seconds behind India while Vietnam could manage 3:33.23s for the bronze. The Indian women missed the Games record of 3:28.68s by a very narrow margin. What makes the gold even more glittering is that they are a young group. Poovamma, at 28, is the oldest. Sarita Gayakwad is 24, Hima 18 and VK Vismaya 21. Both Povamma and Hima, who undoubtedly is among the most promising young athletes in the continent, had on Wednesday claimed silver in the 4x400m mixed relay as well. Their collective effort kept a proud Indian legacy intact in the Asian Games—they have topped the particular stream in every edition of the event since 2002 edition in Busan, where a talented group of Jincy Phillip, Manjeet Kaur, Soma Biswas and KM Beenamol ran terrifically. 31st Aug 2018 @ 22:30 hrs. A real golden day for India at Asian games . .. .. there would be some comments comparing the winner’s poverty-stricken background with the money paid to Cricketers - at Southampton, Sam Curran and his 81 partnership with Mooen Ali lifted England from dumps to 246. ¬ Cricket is not all IPL stuff .. .. in later 1970s remember a Buchibabu match at Marina when Gundappa Viswanath, Parthasarathi Sharma, Ashok Mankad, Kirmani, Dhiraj Parsana and others played at Marina grounds .. .. and the drinks was water in an aluminium kettle that had so many dents ! - gone are those days …. ..
Kamatapur is a historical and cultural region of South Asia, comprising present areas of Northeast India, Bangladesh, Nepal and Bhutan. The Koch Rajbanshi people of South Asia, particular Northeast India consider themselves as Kamatapuri, since the historical memory of the Kamatapur is still alive in their imagination and they continue to protect and preserve the Kamatapuri culture, language and art despite many challenges. In the mid of the 13th century Sandhya Rai established the Kamrup Kamata Kingdom comprising areas of present North Bengal, Lower Assam and some areas of present Bangladesh. Koches around the world are known by various names and styles which are synonyms to each other and means the same community. The Koch Rajbongshi (Koch), also known as Rangpuri, Rajbanshi, Koch Rajbanshi, are an ethnic group inhabiting parts of Assam, northern West Bengal, and some pockets on the eastern parts of Nepal, Bihar, Bhutan and northern Bangladesh. A heptathlon is a track and field combined events contest made up of seven events. The name derives from the Greek hepta(seven) and áthlon, meaning "feat". A competitor in a heptathlon is referred to as a heptathlete. There are two heptathlons – the women's heptathlon and the men's – composed of different events. The men's heptathlon is older and is held indoors, while the women's is held outdoors and was introduced in the 1980s, first appearing in the Olympics in 1984. Women's heptathlon is the combined event for women contested in the athletics programme of the Olympics and at the IAAF World Championships. The women's outdoor heptathlon consists of : 100 metres hurdles; High jump; Shotput; 200 meters, long juml, Javelin throw & 800 metres. Barman, with a bandaged chin continued to compete in the heptathlon event with severe toothache and excruciating pain as she’d landed her chin on her knee during one of the events. Going into the last of the seven event discipline that happens over two days, the 800m run, Barman topped the standings. In her final event, the 21 year old strategized her run perfectly, to bag a whopping 6026 points, personal best score, in the end to become the first Indian woman to win an Asian Games heptathlon gold. This is the first ever gold for India in the event at the Asiad. After Barman, Wang Qingling of China scored 5954 to take silver while Japan's Yuki Yamasaki produced her personal best of 5873 to bag the bronze medal. All night, her jaw throbbed with pain. It was so excruciating that Swapna Barman considered pulling out on the final day of the Asian Games heptathlon, where she trailed Wang Qingling of China. The gum infection — too many chocolates, she said — made the task of 32 points seem a mighty ordeal. On Wednesday, the 21-year-old daughter of a rickshaw puller and a tea-picker won India’s first heptathlon gold in the Asian Games, working her way through the seven events spread out over two days. Barman, with a bandage on her jaw and her now-famous 12 toes encased in special shoes, took on the pain and Qingling during the last three events of the heptathlon — long jump, javelin and 800m. For the Rajbongshi girl from Bengal’s Jalpaiguri district, winning has always been a journey through pain. Her feet with 12 fingers would not fit into regular shoes, but she had to squash her toes in, the pain exacerbated when she landed after jumps. The family struggled to fund her sports training, until scouts spotted her and she picked up scholarships, including sponsorship from Rahul Dravid. Her father has been bedridden after suffering two strokes, and her mother works as a maid and a tea-picker. Barman herself has battled injures, chronic back pain, physiotherapy sessions, and the aching jaw in Jakarta. Today’s Google doodle is on a man – after whom an adjective was coined in English language. : Bradmanesque is an adjective that attributes the class, consistency and high scores made by Sir Donald Bradman. Comparisons never end, though there cannot be comparisons between players of different era. I feel Virat Kohli cannot be compared with the feats of Sunil Manohar Gavaskar – thus Bradman’s days were even older and far different when he enslaved bowlers, scoring a century every other innings or two -or three. Bradman elevated - or reduced, according to your point of view - batsmanship to an exact science. People who had watched him appreciated his punitive and swift killing strokes acclaiming them to be perpetually thrilling, and the cause of wonder. Yet, this English Cricketer who ended with only 44 wickets in his entire career could remain talked about for that single wicket of Don Bradman for a duck ! – that was William Eric Hollies, a fastish leg-break bowler who rarely had much use for the googly”. Bradman was indeed a legend, to many simply the greatest cricketer to ever grace the gentleman's game. No other cricketer has transcended the sporting climate quite like Bradman, from his incredible batting record to his status off the pitch; no one has come close to the respect awarded to him. The Australian hero scored 6,996 runs for his country and still holds 20 Test records, including the highest batting average and most runs against one opponent - despite retiring 70 years ago. Today (27.8.2018) on what would have been his 110th birthday, Google Doodle is honouring him with a Doodle, imagining him drive a shot through the Google logo. Born on August 27 in Cootamundra, New South Wales in 1908, to George and Emily Bradman, he lived alongside his older brother Victor and sisters Islet, Lilian and Elizabeth May. Bradman is said to have told his father, having been taken to watch an Ashes Test match at the Sydney Cricket Ground in 1921, that "I shall never be satisfied until I play on this ground." Bradman developed his skills by hitting a golf ball off the curved base of a water tank, using a cricket. One of the darkest episodes in cricket history, that caused a diplomatic furore in both England and Australia and forced the rules of cricket to be changed, the bodyline, was charted out by England as a way of getting Bradman out, and captain Douglas Jardine came up with the perfect plan for the 1932-33 trip Down Under, however unsporting to do so - use "leg theory". The basic premise was get fast bowlers Harold Larwood and Bill Voce to bowl very quickly at Bradman's body and pack the legside with fielders, forcing him to hit straight to them while avoiding getting hit. It was hostile, dangerous and left the Australian press, players and fans up in arms. Bodyline forced the authorities to allow a maximum number of fielders on the legside and the number of bouncers in an over. Nevertheless, Bradman still managed to average 56.57 during the series! Even among cricketing legends, Don Bradman's stature is one that no other player has come close to. His stats are so much better than anyone before, during or after his time, that it truly boggles the mind. Various arguments are offered about the changes in the game today to try and explain 99.94: fielding standards have improved, making it tougher for batsmen to score; captains are more agreeable to posting defensive fields and restricting the runs; the game is played across several countries as opposed to just a few during Bradman's time, making it more difficult to adjust to different conditions. While these statements may be true as independent facts, they do nothing to diminish the sheer genius of the Don, and the staggering magnitude of his achievements. The most famous number, of course, is his Test average, which is 64%; highest ratio of centuries per innings played: 36.25% (29 centuries from 80 innings); most runs against one opponent: 5,028 (v England); Most times of scoring a century in a single session of play: 6 (1 pre lunch, 2 lunch-tea, 3 tea-stumps); most runs in one day's play: 309 (1930); most double centuries: 12 and more ! There were controversies during his period too. In 1935, when Australia was to tour South Africa, Board of Control wanted Bradman to lead the team, yet, later it Bradman's withdrawal was announced from the team due to a lack of fitness. The captaincy was given to Vic Richardson, Bradman's predecessor as South Australian captain. Australia defeated South Africa 4–0 and senior players such as Bill O'Reilly were pointed in their comments about the enjoyment of playing under Richardson's captaincy. A group of players who were openly hostile toward Bradman formed during the tour. In the final Test at The Oval, Bradman walked out to bat in Australia's first innings. He received a standing ovation from the crowd ; his average at that time was 101.39. Playing a spinner, Bradman pushed forward to the second ball that he faced, was deceived by a googly, and bowled between bat and pad for a duck. An England batting collapse resulted in an innings defeat, denying Bradman the opportunity to bat again and so his career average finished at 99.94; if only he had scored just four runs in his last innings, it would have been 100. A story developed over the years that claimed Bradman missed the ball because of tears in his eyes, a claim Bradman denied for the rest of his life. The bowler was William Eric Hollies who is remembered more for that all important wicket of Donald Bradman for a duck. Of his 6996 runs in 52 tests, 715 came against India in 5 tests. At Sydney, in Dec 1947, was a match with difference. India made 188 & 61/7 drew with Australia, who were bowled out for 107. Bradman was bowled by Hazare for 13. Amir Elahi & Dattu Padhkar made their debuts. 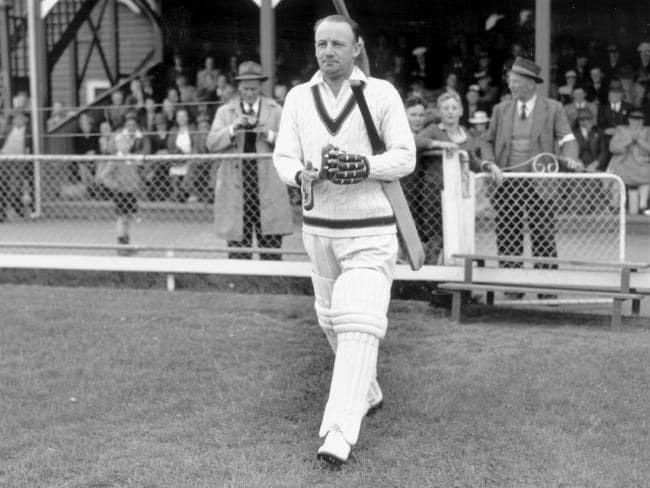 Don Bradman is the only Australian cricketer to ever be knighted for his services to the game. He was appointed Knight Bachelor in 1949. He was recognised by the Australian Government when they minted a series of 20c coins in his honour. He was the first ever Australian to be featured on the Australian postage stamp while still alive. The ABC’s GPO box number is 9994, chosen because it was The Don’s batting average. The flag “Triranga’ attracts most ~ every time we see, WE SALUTE THY !! ~ here are some random read on what happened in Madras on that great day, and who hoisted the National flag !! The Nation celebrated the 72nd INDEPENDENCE DAY with pomp and gaiety - the great day of 15th August when BHARAT was liberated from foreign rule. .. due to the blood and sacrifices of innumerable martyrs. Read that though freedom dawned at 12 midnight, the flag at Fort St. George was hoisted only on the morning of August 15, 1947, at 5.05 am. The union jack was lowered in the Fort and amid cheers; the National flag with the chakra was hoisted. 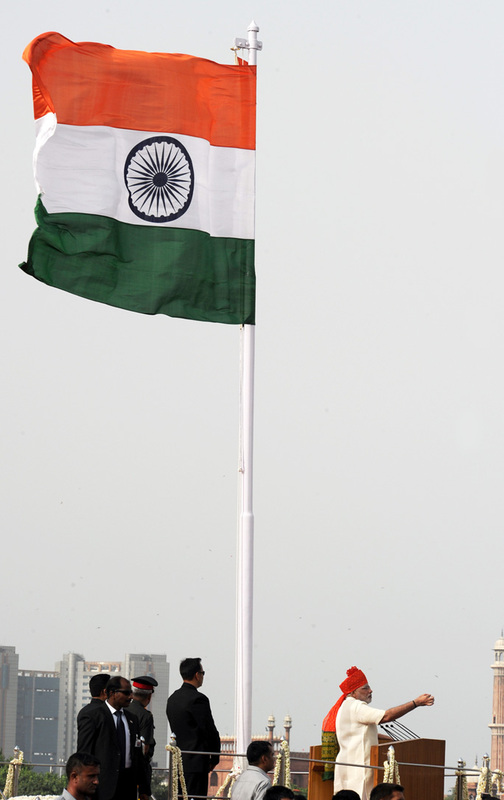 The flag was made of silk and measured eight feet by 12 feet, went fluttering atop the 150-foot high flagstaff (hailed as the tallest flag-post in India and over 300 years old). In all probability, the flag was woven at the Karnataka Khadi Gramodyoga Samyuktha Sangha in Hubli. The flag is still exhibited in the Fort Museum. Horsemen in glistening jackets and gold sashes stood amid the large crowds that streamed along the beachfront to Fort. St George, to gaze at the Indian flag fluttering over the first Fort of the British East India Company. Later in the day, Governor of Madras Presidency, Archibald Nye hoisted the national flag at the nearby Island Grounds to the sound of trumpets blaring and the Premier of Madras, Omandur Ramaswami Reddiyar, unfurled the tricolour at Ripon Buildings. The biggest crowd was in the Old Congress House Grounds in Royapettah where the Congress flag was removed and the national flag hoisted. Chennai always celebrated with music. The music lined up for the eve of Independence included concerts by Ariyakudi Ramanuja Iyengar at Gokhale Hall and Ms. Subbulakshmi who performed on AIR that evening at 8. There was cheer on many fronts. Jail doors opened for many convicts who had been granted a pardon. That one of the splinter groups called it a day of mourning and stayed away from the celebrations is an aberration and would not merit any further mention in this post. Everytime when we read about Independence struggle and that great day of Aug 15, 1947, we feel happy and remember those martyrs whose sacrifices have given us the freedom this day. .. that event led to partition of this great country and innumerable blood spilling is always tragic. Independence of India was preceded by the partition of British India on the basis of religious demographics. The partition of the country gave birth to the Dominion of Pakistan, a new homeland for Indian Muslims (which would later be further divided into the Islamic Republic of Pakistan and the People’s Republic of Bangladesh). The partition of India is one of the most violent and tragic events in the sub continent in recent history and saw massive migration across the border. Millions had to flee from their homes, leaving behind all their possessions in fear of communal violence. Ten million people travelled miles on foot, bullock cart and train towards their newly promised homes. Back home it was Chennai or Tamil Nadu, but - Madras Presidency, or the Presidency of Fort St. George, and also known as Madras Province, an administrative subdivision (presidency) of British India. The city of Madras was the winter capital of the Presidency and Ootacamund or Ooty, the summer capital. The island of Ceylon was a part of Madras Presidency from 1793 to 1798 when it was created a Crown colony. Following the Montagu–Chelmsford Reforms of 1919, Madras was the first province of British India to implement a system of dyarchy, and thereafter its Governor ruled alongside a prime minister. When the transfer of power took place at New Delhi, thousands of Chennai’s citizens were glued to community radio sets, listening to the proceedings of the Constituent Assembly. “Hundreds marched on roads with torches and tricolour, with drum and music, keeping up an unending refrain of ‘Vande Mataram.’ That great day – 15th Aug 1947 was a Friday - the swearing-in of Governor Archibald Nye and the Prime Minister (which was how the position of Chief Minister was known then) O.P. Ramaswami Reddiar took place in the Cabinet Room at Fort St. George. The then Chief Justice of the Madras High Court Frederick Gentle administered the oath of allegiance to the Governor, who later swore in the Ministers. The Governor hoisted the national flag on the Island Grounds. Mr Reddiar unfurled the flag at the Ripon Buildings, the headquarters of the Chennai Corporation. So here is something on the 1st Governor of Tamil Nadu (aka Madras Province) – Nye. Lieutenant General Sir Archibald Edward Nye GCSI, GCMG, GCIE, KCB, KBE, MC (1895 –1967) was a senior British Army officer who served in both world wars. In the latter he served as Vice Chief of the Imperial General Staff(VCIGS). After the Second World War he served as Governor of Madras – after which appointment Nehru asked for him to stay on as High Commissioner in India. He subsequently served as High Commissioner to Canada. Archibald Edward Nye was born at Shipstreet Barracks, Dublin, to Charles Edward Nye who was a regimental sergeant major in the Oxfordshire and Buckinghamshire Light Infantry, British Army. At the outset of the Great War, Nye went to France with the British Expeditionary Force in 1914 serving as a non-commissioned officer. Wounded twice in action, he was awarded the Military Cross for bravery. Becoming a Major, later he completed his graduation in law and qualified as a barrister at the Inner Temple in 1932. In 1939, Nye was promoted to colonel, with the temporary rank of brigadier, and sent to India to raise a brigade, commanding the Nowshera Brigade. He was to return to London rising in ranks and had the role of representing the Chief of the Imperial General Staff, Alan Brooke, when he was unable to attend one of the many committees on which he sat such as the Chiefs of Staff Committee. In 1944, Nye was knighted as a Knight Commander of the Order of the British Empire, the first of five knighthoods he would ultimately be conferred with. Following his retirement in 1946, Nye was appointed Governor of Madras and served as Governor till 7 September 1948. The day prior to his appointment as Governor there was a major labour strike in Madras. The rest of his term was plagued by peasant uprisings all over the province. Nye was also the Colonel-in-chief of the Madras Regiment from 1946 to Mar 1949. In Nov 1947, when Sir Frederick Gentle, the Chief Justice of the Madras High Court resigned over the Government of India order that the Chief Minister of the particular state should be consulted along with the Union Home Minister with regard to the selection of High Court judges, Nye expressed support for Gentle against political interference in appointment of judges. Though Nehruvian congress held him in high posts, Nye was strongly critical of Britain's efforts to admit India into the British Commonwealth. He felt that from the defence point of view, India would be "an ailing child who has literally, nothing, whatever to offer but who, on the other hand, constitutes a grave liability". From his term in Madras, Nye was appointed the UK's High Commissioner to India, later UK’s High Commissioner to Canada. Nye was a keen billiards player and teetotaller. Biblio : Wikipedia; https://www.dtnext.in/ and other web. 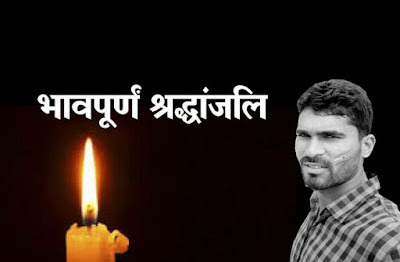 saluting Mukut Bihari Meena ~ and the nameless Indian Jawans !! Pictures are great like the one below ~ it is picturesque mountainview of Dras, situated about 60 km away from Kargil, on the road to Srinagar. Popularly known as ‘The Gateway to Ladakh’, Dras is the coldest inhabited place in India and the second coldest inhabited place in the world (Siberia being the first). The mountain village of Dras first came into the limelight in the year 1999, when Pakistan Army incursions led to the Kargil War with India. It is a great sight or perhaps a good visit as a tourist, certainly not the best place to live .. .. especially for those jawans who brave the cold, unfriendly weather conditions and .. .. and being single and alone with none in vicinity for many kilo meters, waiting for provisions to be air-dropped once a while – research says that it could drive tough men mad !! - and at such heights stands our ARMY JAWANS protecting us – allowing us the freedom of expression in social media ..
~ and from there they get redeployed in civil areas when natural calamities or other disturbances occur – they don’t have a name – they don’t try to claim credit for what they do – yet they meticulously perform the task bringing in normalcy – then politicians take over clammering for mikes to claim that they have done things for the common man !!! The Indian Army has time and again lived up to its tradition of valour, heroism, sacrifice and fortitude. It stands vigil along the border, watchful, prepared for any sacrifice so that the people of the country may live in peace and with honour. The Indian Army is that and much more. Spirit of Selfless Sacrifice The tradition is never to question, but to do or die for the three "Ns"; Naam, i.e. name-honour- of the unit/Army/Nation, 'Namak'(salt) i.e. loyalty to the Nation, and 'Nishan', i.e. the insignia or flag of his unit/regiment/Army/Nation which the soldiers hold afloat willingly. From adequate road infrastructure for movement of troops and supplies to new types of tunnel defences and a high technology surveillance apparatus, India has moved on from the Kargil war 19 years ago, even though intelligence inputs suggest that not much has changed on the Pakistani side of the Line of Control (LoC), writes Economic Times. While basic facilities like regular water supply and electricity remain a problem, troops have access to more comfortable lodging and an adequate stocking of ration and medical equipment during winters so that even posts located at altitudes ranging from 12,000 feet to over 18,000 feet are not vacated in the winter season, which lasts for about six to seven months. 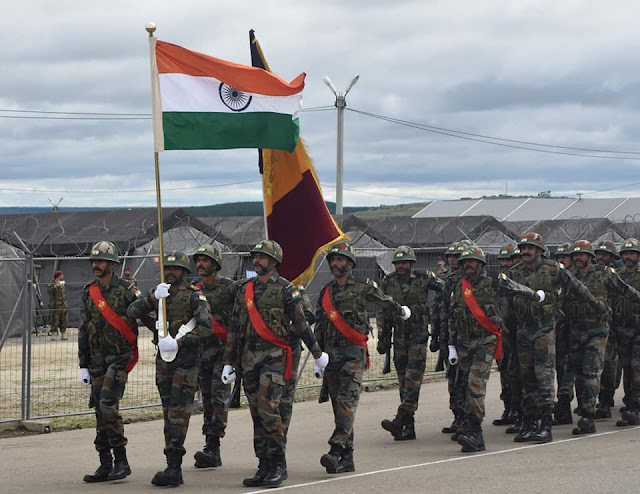 Made-in-India thermal insoles, snow goggles, ice axes, boots, mountaineering equipment, and sleeping bags are to be provided to soliders stationed in Siachen and Doklam. India, spends Rs 800 crore annually to import extreme Cold Weather Clothing System (ECWCS) and mountaineering kits, has okayed a project to manufacture specialised clothing, sleeping kits, and equipment for armymen deployed in the world's highest and most dangerous battlefield - Siachen. The government has decided to produce the military equipment indigenously to boost the Make-in-India initiative. 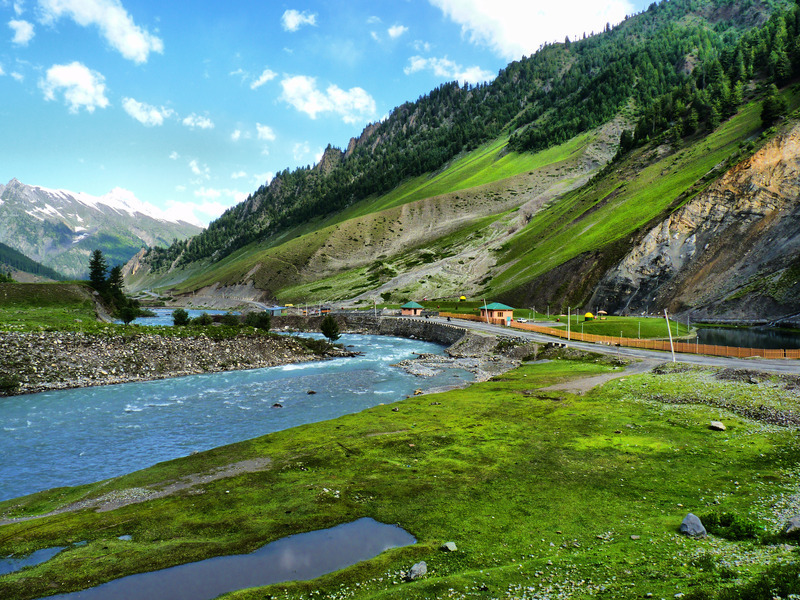 The Neelam River originates from Krishansar Lake in the vicinity of Sonamarg and runs northwards to Badoab village where it meets a tributary from the Dras side and runs westwards along the Line of Control in Jammu and Kashmir. It is is 245 kilometers long, covers 50 kilometers in Jammu and Kashmir and the remaining 195 kilometers in Kashmir now occupied by Pakistan. It was a poignant scene at the village of paratrooper Mukut Bihari Meena who died fighting the militants in Kupwara, when his five-month-old daughter sat on his coffin and lay on it when his body arrived. The scene left everyone teary eyed and the Jhalawar district collector penned down an emotional letter to the girl. Jhalawar district is one of the 33 districts of Rajasthan state, bounded by Kota, Baran, Guna, Rajgarh & Shajapur districts. The district is part of Kota division. The former ruling family of Jhalawar belonged to the Jhala family of Rajputs. At Kota Madhu Singh, a Jhala Rajput became a favorite with the Maharaja, and received from him an important post, which became hereditary. On the death of one of the Kota rajas (1771), the state was left to the charge of Jhala Zalim Singh, a descendant of Madhu Singh. Under his administration, which lasted over forty-five years, the Kota territory was respected by all parties. In 1838 AD, British intervention and internal politics resulted with the decision to dismember the Kota state, and to create the new principality of Jhalawar. When last rites of army commando Mukut Bihari Meena, who was martyred in the forests of Kupwada during an encounter, was carried with full state honours at his native place, Ladaniya village in the Jhalawar district of Rajasthan – there was the picture, a very sad one of his 5 month old daughter on the coffin ! turning everyone emotional, leaving onlookers teary-eyed as villagers, representatives of the Armed Forces and the Rajasthan government paid homage to the brave soldier. The Dist Collector too was present. Mr Jitendra soni, the Collector of Jalawar Dist penned down an emotional letter to the infant.. Addressing the letter to Meena’s Aaru, Soni highlighted how people were emotional seeing the innocent child laying on the tricolour covered coffin. “You sat on the coffin and lied on that without crying. Moments before, you had seen the face of your father. It was very emotional,” read a line from his letter written in Hindi. “I and all the Army officers were watching you doing this and I know every one of us was thinking in our own respective ways but your innocence and your father were at the centre of our thoughts,” the letter read. “Not only this area, but the blessings of every responsible and sensible citizen of the entire country with you. Grow well and make your father’s glorious martyrdom your pride,” Soni added. Remember – let us say this to ourselves, every morning, irrespective of whichever party rules the Nation – it is the supreme valour, courage and sacrifice of those Jawans which allow us the liberty of enjoying life, living peacefully – and for this we are indebted to Indian Army, those nameless Jawans – let us always respect, love and regard them in every speech and action. A top Army officer had an interesting point to make while speaking about the reported alienation of Kashmiri youth. If everybody is alienated in Kashmir, then why do such a huge number youth join the Indian Army, Lieutenant General Satish Duo asked. He was speaking on the sidelines of a passing out parade at the Jammu and Kashmir Light Infantry Regimental Training Centre at Rangreth. The details given out by the officer comes as a relief as the Union Home Ministry had recently said that nearly 82 youth from Kashmir had joined terror groups this year. The numbers joining army is more than double-fold .. .. ..
Chennaites would never forget that first week of Dec 2015 when water flowed over Saidapet bridge – inundating many parts of the city - several reports published by media houses crammed calling it the “negligence” of Government officials in either not releasing water at the right time or in not giving out enough warning to people living in areas around the Adyar River so that they could shift to safety. .. .. .. and there were invidious comparisons on how Commies were managing the neighbourhood State. Every time people talk about democracy, freedom of expression and more – there could be some Red thinking behind .. they could well remember the History, least the recent history – of the bloody occurrence 50 years ago. At 1:55 a.m. on August 21, 1968 Czechoslovak Radio began broadcasting an announcement from the Czechoslovak Communist Party leadership: The country had been invaded just before midnight by five Warsaw Pact countries. An estimated quarter of a million soldiers from notional ally states flooded into Czechoslovakia. Thousands of enemy tanks, some of which had arrived on Soviet army planes at Prague Airport, were rolling through the country. On that fateful day, fifty years ago Soviet tanks rolled into Czechoslovakia to violently quash the democratic reform movement against communism known as the Prague Spring. Led by Alexander Dubcek, then-newly elected Communist Party leader, Czechoslovakia in the spring of 1968 initiated a process of liberalising a communist regime that had seized power 20 years earlier. It was claimed to be "socialism with a human face" but when thousands of tanks accompanied by 200,000 Warsaw Pact soldiers from Russia, Bulgaria, Hungary, East Germany and Poland invaded Czechoslovakia, many were brutally massacred. There has been so much of news and views on social media on how much Indian Govt gave and why Indian Govt spurning offer of UAE was bad !! - it was reported all over that the Central Govt rejected an offer by the United Arab Emirates government to give $100 million to a special fund for Kerala state after its floods which killed more than 400 people. Though a statement of Foreign ministry read that it was in tune with the existing policy - "In line with the existing policy, the government is committed to meeting the requirements for relief and rehabilitation through domestic efforts," there were memes and Kerala state chief minister Pinarayi Vijayan called for "high level" talks with the national government so the UAE money could be accepted. The sympathizers instead of praising the effort of the Centre, the Army and other organizations like RSS involved in relief work, was bent on creating memes that the UAE offer was more than the $97 million promised by India's central government. Vijayan has asked for a $375 million package from the government, saying the state must confront more than $3 billion in devastation. Now comes the climax at a time when war of words rages over whether to accept Rs. 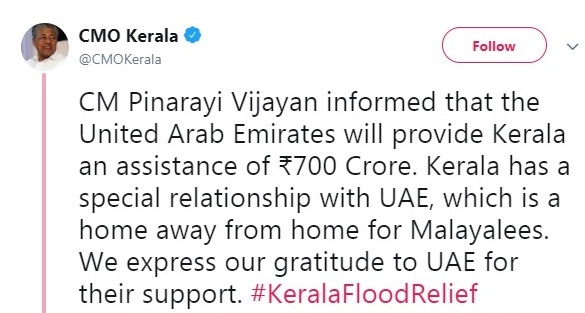 700 crore offered by the United Arab Emirates for flood-hit Kerala. NDTV and other frontline media report that UAE has said it has yet to make any official offer and has not fixed any amount as financial aid, even though multiple statements from Kerala ministers refer to the so-called offer. The UAE's ambassador to India, Ahmed Albanna, reiterated today what his country announced a week ago, that it has formed a committee to ensure the funds reach the right beneficiaries in Kerala. "We have set up a national committee for aid to Kerala. The committee will work with the MEA (India's foreign ministry) and the embassy to ensure the funds reach the needy," Mr Albanna told NDTV. "No official announcement on the amount has been made by the UAE government yet," the ambassador said, adding that the foreign ministry had no communication from the government of UAE. The centre has maintained that it has not received any official offer for financial help from any nation for Kerala. 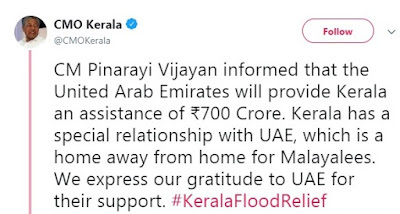 Kerala Chief Minister Pinarayi Vijayan had, however, tweeted on August 21 that the UAE will "provide Kerala an assistance of Rs. 700 crore. Kerala has a special relationship with UAE, which is a home away from home for Malayalees. We express our gratitude to UAE for their support." The coastal state's ruling Left Democratic Front has been criticising Prime Minister Narendra Modi's government for depriving it of foreign funds while providing hopelessly inadequate funds for rehabilitation efforts after the record flood that has left nearly 240 dead and lakhs displaced since August 8. The state's Finance Minister, Thomas Isaac, had tweeted "We asked the union government for financial support of Rs. 2,200 crore; they grant us a precious Rs. 600 crore. We make no request to any foreign government but UAE voluntarily offers Rs. 700 crore. No, says union government, it is below our dignity to accept foreign aid. This is a dog in the manger policy." Here are something interesting which do not meet the eyes of common man. · The magnitude of the Kerala catastrophe could have been minimised if the agencies involved in reservoir management had used a technically sound approach in the opening of the dam gates, said Professor Nayan Sharma, a dam expert and former professor at IIT Roorkee. In an exclusive interview with Firstpost, Sharma, who visited a number of dam sites in the southern state along with a dam break analysis team formed by the Kerala government in 2011, said that there should be a proper inquiry on why no technically sound method was followed while opening up the dam gates. “It is a known scientific reality that no gate of any dam with a full reservoir should be opened all of a sudden. It should be opened gradually within a long span of time to prevent flooding. But in the case of Kerala, it was seen that the gates of 35 dams were opened at the same time, which resulted in the massive flood,” he added. 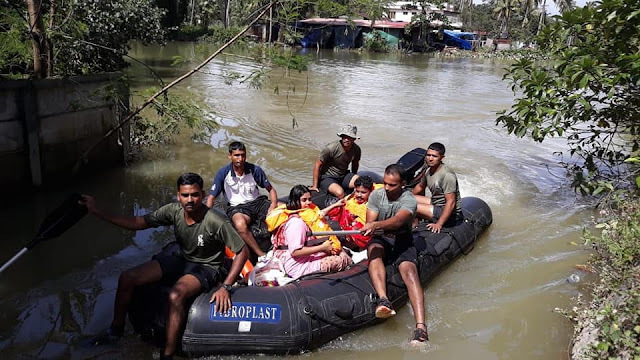 · Amidst rows on foreign funds, Central Govt said Rs 600 crore released to the flood-ravaged state was only the advance assistance and that additional funds would be released when an inter-ministerial team visits the state again and assesses the damage. 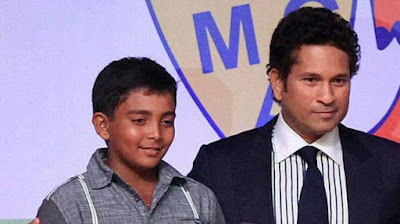 · The turning down of the UAE’s reported offer was very much in tune with the National Disaster management plan formulated in the days of Dr Manmohan Singh, immediately following tsunami in Dec 2004.
young Prithvi Shaw called for National duty ~ will he debut ?? The Societies Registration Act, 1860 allows the registration of entities generally involved in the benefit of society - education, health, employment etc. This post includes something on a high profile Organisation registered under TN Registry of Societies. The British Indian Empire, with a wish to encourage such activities and to promote the formal organisation of groups of like minded people, incorporated the Act 21 of 1860, the Act continues until today and being an Act of Parliament, comes under the Right To Information Act, wherein the government is legally responsible to give any information requested by any citizen of India with respect to any society !! The 4th Test starts at Southampton on 30th Aug & 5th test at London on Sept 7 – will this young prodigy spotted as early as 2010 make his debut ??? Sachin Tendulkar had a very special message for young opener after the latter received his maiden Test call-up for Team India. In 2010, Sachin said "I asked him not to change his grip or stance, irrespective of any future instructions from his coaches. If anyone asks you to do so, tell them to come talk to me. Coaching is good, but overcooking a player with tweaks is not," Tendulkar said on his app '100MB'. Here is another prodigy ! Way back in Nov 2013, I had posted on this (then) school boy - Prithvi Shaw, a 14-year-old from Mumbai, having entered the record books after smashing 546 runs - the highest score by an Indian batsman in minor cricket - during a Harris Shield match at the Azad Maidan in Mumbai. Shaw's innings lasted 367 minutes over two days and included a whopping 85 fours and five sixes which helped his team, Rizvi Springfield, take an 899-run first-innings lead in the A division match against St Francis D'Assisi. Mobbed by television cameras after the end of Rizvi's innings, a calm Shaw said, "It is a good score for me and my team. Our coach just asked me to concentrate on every ball. The only plan was to score as many runs as we could. I wasn't thinking of a record, but it feels good." Before we read more about him, Indian women pacer who would merit a comparison with Kapil Dev, Jhulan Goswami has retired from T20Is, calling time on a career that began 12 years ago with the first ever T20I for India women in August 2006. The announcement comes with the Women's World T20 - to be played in the West Indies - less than three months away. . In May, she surpassed Cathryn Fitzpatrick to become the highest wicket-taker in women's ODI history. She played just 10 tests taking 40 wickets – 169 One dayers with 203 wickets – on top with an economy of 3.25 ! The interesting news is - batsmen Prithvi Shaw and Hanuma Vihari have been called up to India's Test squad for the final two matches in England. Opening batsman M Vijay, who was out for a pair at Lord's and then dropped from the XI at Trent Bridge, and left-arm wristspinner Kuldeep Yadav, whose selection in the second Test had raised eyebrows, have been dropped. It is understood that Vijay's poor form - six single-digit scores in his last 11 innings - has prompted the team management to think about grooming a younger opener. At 34, Vijay's international future now perhaps looks uncertain. Kuldeep has been sent back home to play for the India A team in two four-day matches against Australia A in Visakhapatnam. Indian coach Ravi Shastri told the media at the end of the Trent Bridge Test that offspinner R Ashwin, who was suffering from a hip injury, would be fit in time for the next Test in Southampton starting August 30. There is also left-arm spinner Ravindra Jadeja in the squad. In September 2017, at 17, Shaw became the youngest player to score a century on Duleep Trophy debut, a record previously held by Sachin Tendulkar. He was then named captain of India's Under-19 squad for the 2018 World Cup. During the tournament, he was sold to Delhi Daredevils for INR 1.2 crore (USD 187,500 approx) at the 2018 IPL auction. More interesting news is, pursuant to the order of the Honourable Supreme Court of India dated 9th August 2018, The Board of Control for Cricket in India (BCCI), through its CEO Mr. Rahul Johri, registered its new constitution as approved and directed by the Honorable Supreme Court with the Registrar of Societies of Tamil Nadu at Chennai. The Committee of Administrators (CoA) has taken full control of the BCCI. All the sub-committees of the BCCI except the selection panels and the Cricket Advisory Committee (CAC) have been annulled. The powers of the three office-bearers of the BCCI - CK Khanna (acting president), Amitabh Choudhary (acting secretary) and Anirudh Chaudhry (treasurer) - have been clipped and they will now need the CoA's mandate to approve any decision or travel. With the BCCI registering its new constitution, which was approved by the Supreme Court recently, the CoA has said the professional management of the board, led by the CEO Rahul Johri, will take charge of the daily affairs until fresh elections are conducted. The CoA, which comprises Vinod Rai (chairman) and former India women captain Diana Edulji (member), said it has issued this fresh directive in the wake of the new constitution coming into being from August 21, when it was registered. "As a consequence, the earlier Constitution of the BCCI ("Old Constitution") stands extinguished and the New Constitution has come into force," the CoA said in a three-page email distributed to the office-bearers and the professional management. Under the new constitution the governance of the BCCI will be handled by the Apex Council. Cabinet of New Zealand - is the New Zealand Government's body of senior ministers, responsible to the New Zealand Parliament. Cabinet meetings, chaired by the Prime Minister, occur once a week; in them, vital issues are discussed and government policy is formulated. Though not established by any statute, Cabinet has significant power in the New Zealand political system and nearly all bills proposed by the Cabinet in Parliament are enacted. All ministers in Cabinet also serve as members of the Executive Council, the body tasked with advising the Governor-General in the exercise of his or her formal constitutional functions. Jacinda Kate Laurell Ardern- is the 40th and current Prime Minister of New Zealand since 26 October 2017. Julie Anne Genter is an American-born New Zealand politician who is a member of the House of Representatives representing the Green Party of Aotearoa New Zealand. She is currently the Minister for Women, Associate Minister for Health and Associate Minister for Transport. She holds dual citizenship of New Zealand and the United States. Genter was born in Rochester, Minnesota, United States, in 1979, and grew up in Los Angeles, California. The Ministry for Women, ‘Te Minitatanga mō ngā Wāhine’, is the Government’s principal advisor on achieving better results for women, and wider New Zealand. The Ministry has three priority areas: valuing women's contributions; more women in leadership and keeping women free from violence. The Ministry carries out its work by acting as a catalyst for action and change, and by getting key issues on the agenda of government agencies and other relevant organisations. In an interesting news, the PM of NZ is quoted as saying that ‘ at least half of the senior leaders in the public sector will be women by the end of 2019, and workplaces will be flexible “by default” are among goals in an Action Plan to eliminate the gender pay gap in the public service, launched recently. “The Action Plan will accelerate action across the public service to address the underlying workplace culture issues that drive the gender pay gap,” says Mr Hipkins. “This is a critical piece of work that ensures everyone in our public service is paid fairly for the role they do." Among the key focus areas is equal pay – by the of 2020, all agencies will have closed any gender pay gaps within the same roles. “Government has a leadership role to play to ensure that women are treated fairly. As responsible employers, government can demonstrate what works and get the private sector on board. This plan sets the direction of travel for government departments to start fixing the pay imbalance,” says Ms Genter. It is Ms Genter and the cycling done by the New Zealand's minister that has attracted global news. The women cycled herself to a birthing unit as she prepares to have her first child. 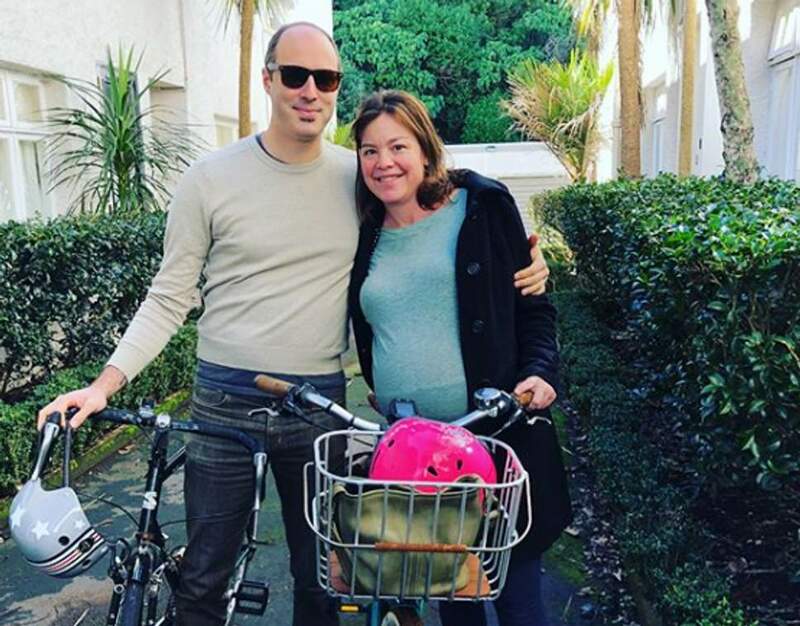 Green Party politician Julie Anne Genter posted a picture on Instagram saying she had arrived at Auckland City hospital to be induced – and had travelled by bicycle. “Beautiful Sunday morning for a bike ride, to the hospital, for an induction to finally have this baby. This is it, wish us luck! "My partner and I cycled because there wasn't enough room in the car for the support crew," she wrote. Genter, who was 42-weeks pregnant, said the ride was mostly downhill. The news comes just weeks after the country’s prime minister Jacinda Ardern returned to parliament following the birth of her daughter Neve. The country's associate transport minister, Genter, 38, is a well-known and outspoken cycling advocate. Before she left the capital, she said there was a sense of hopefulness among women seeing government ministers becoming mothers for the first time. But having babies in office is far from new for Kiwi politicians. Labour's Whetu Tirikatene-Sullivan was the first woman to give birth while an MP, in 1970. National's Ruth Richardson breastfed at work in 1983 and a child-care centre was established in parliament in the 1990s. A playground is currently being built on parliament's grounds amid a push by the Speaker of the House to make the precinct more family friendly.